Living in/ Vivre à REXTON! Legend says a Chieftain set off to find a River of Fire, a place free of war and sickness. He discovered our river at sunset, ablaze in brilliant red, and settled here. A visit to the Richibucto River Museum will give you the complete story, and tell you of our first settlers, Eastern Canada’s Mi’kmaq First Nation. 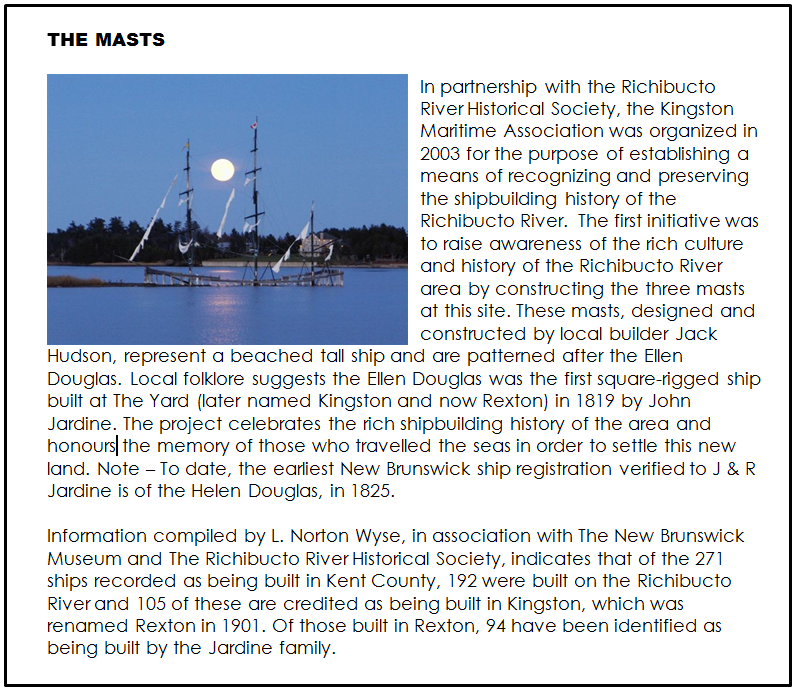 See the historic side of Rexton with a treasure map. Search for clues that will take you back to our history with little tidbits of information. Stop at the Bonar Law Historic Site and tour the 1870s home and birthplace of Andrew Bonar Law. Tour our landmark building, St. Andrew’s Church, and the two other churches.Peek at treasures overflowing from the shelves of our local craft stores and discover lost artifacts at Rexton Antiques. A stroll in MacNarin Park will showcase the sensory delight of hundreds of blooms. End your evening at Jardine’s Inn where you can relax and be treated like royalty or take a guided tour with old-fashioned lanterns, walk the dark streets of downtown with a local storyteller and hear the tale of the “Pine Lady”! Open daily throughout July and August. For more information, visit our website at www.bonarlawcommons.com. For more information during operating season call (506) 523-7615. During off-season, call (506) 523-6921 or e-mail villageofrexton@nb.aibn.com.